Finding plants to purchase can be challenging for native species enthusiasts. Small local growers of nursery stock have nearly disappeared, and today many nurseries purchase plants that have been propagated and grown somewhere else. More often than not, nurseries are retail outlets, rather than growers of plants. 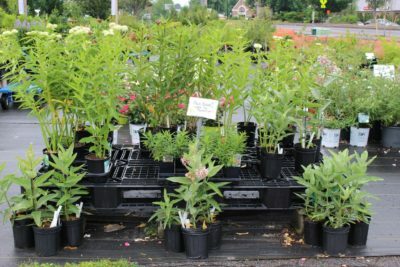 A significant challenge for local garden centers with regional horticultural experience is that their profit margins have been cut by big-box stores that have jumped into the market with a lot of cheap plants. Across the country, from the steamy South to the cool North and the arid West, the same mass-produced plants are offered for sale with no hint of their place of origin. These plants may be cheap, but they are not necessarily well-adapted to the region in which they are sold. Also they are often treated with pesticides that can harm pollinators and other local fauna. Another recent change in the nursery trade is in the type of garden plants available. In the last few decades horticulturists have emphasized the propagation of “superior individuals.” These are called cultivars, and “desirable” traits are selected solely based on attractiveness to people rather than the needs of pollinators or other fauna. To maintain these ornamental traits plants are cloned, increasingly in laboratories with a process called tissue culture, and may even be patented. Since they are identical clones, these plants do not contain the genetic diversity inherent in seed grown plants – making them less able to stand up to changing environmental conditions or pests. This trend to produce only chosen individuals is happening with our wild flora too. In nurseries, they frequently have catchy names like Chelone “Lipstick” and Ilex “Jim Dandy.” If a native cultivar is your only choice at a nursery, go for it, but recognize it as a step in the right direction with natives, not the ideal. Seed grown natives contain the genetic diversity that will help our native species be more adaptable to an unknown future. Whenever possible, seek out a nursery that propagates and grows the plants they sell. These people are sowing the seeds and otherwise propagating locally, and they have a deep understanding of the plants they produce – exotics as well as natives. Maine is ripe for a revival in nurseries that sell locally produced plants, especially ones that specialize in native and organically grown plants. This is what the public is asking for, and all the conservation organizations, from Audubon Society to US Fish and Wildlife, are urging people to plant more natives. Before you go, make a list of the plants that you are looking for (including their Latin names to remove ambiguity). For a list of recommended native species for your growing conditions, see our Comprehensive Plant List. Ask the nursery staff if they have native plants grouped together. Tell them that you are particularly interested in planting natives and it would be helpful if they were displayed together. If not, do they have a list of the native species that they offer for sale? This will guide you as you cruise the aisles and read the pot labels. Most nurseries sell some native shrubs and trees. Herbaceous species can be more limited. As noted above seek out native species rather than cultivars whenever possible. Ask where their plants come from. Were they grown locally or purchased “from away” (and how far away)? Also enquire if they have been treated with pesticides, particularly the systemic pesticides in the class of neonicotinoids. These chemicals are absorbed into the tissue of the plant. They kill insects, including pollinating bees and butterflies, and can persist in the environment for several years. This has been in the news a lot in the last few years, and nursery staff should be able to answer this question. If the nursery offers woodland wildflowers, ferns, and boreal plants, ask if they were nursery propagated. Unfortunately these slow-growing species are still commonly wild collected and sold to nurseries. Some of the species that are commonly dug from the wild are lady slipper orchids, trillium, bunchberry and low-bush blueberry (sold as field or woodland dug sods), bluebead lily, Dutchman’s breeches, trout lily, Indian cucumber, goldthread, twinflower, and many species of ferns. While it is possible to propagate many of these plants, their seed germination needs and slow growth require an experienced propagator to produce these plants, usually in small numbers. Ask how they were propagated, and if they can not tell you specifically, do not purchase these plants from that vendor. Planting your garden with wild collected plants is not conservation horticulture because its not commercially sustainable. If your motivation for growing a native garden is to protect nature, then it is important not to purchase plants taken from natural areas. In addition, it undercuts the nurseries who are taking the time to propagate these plants. See our blog post Where the Wild Things Are. If you haven’t found the plant species you were looking for, ask your nursery to carry it. They want to supply what people will buy. Choosing a time to speak to them when the nursery is not busy makes it easier for them to hear your desires. Give them a written list. They may be willing to order these plants for you if they are not in stock. Increasing the supply of locally produced nursery-propagated native plants will require you, the consumer, to be persistent in your wishes. Let’s help our growers make this shift over the coming years so that our gardens and landscapes can be filled with genetically diverse native flora that nourishes the insects, birds, and mammals of Maine. Mulches have become big business and it is important to look carefully at the offerings. Ideally you should be seeking a well-aged hardwood bark mulch. Decaying bark cools the soil, reduces weeds, and supports the soil microorganisms that are beneficial to plant growth and health. Avoid a product called “dark mulch.” It is made from shredded wood waste dyed to look like bark (the wood can include construction waste and pressure-treated wood). Shredded wood is not a good mulch, even if it is not contaminated with toxins. It is high in carbon and will rob nitrogen from the soil until it is completely broken down, a process that takes several years. These dyed mulches are unregulated, we do not know what is in them, and they do not support soil health (which leads to plant health). Sadly, they are everywhere now. Fertilizers: Composts and leaf mold are the best way to build soil fertility. If you have seedlings or potted plants that will need a liquid fertilizer, purchase a sea based product such as liquid seaweed or make your own compost tea.For more detailed information on ecological gardening techniques, read Primer for Ecological Gardening.